Previously announced at the Premiere event on June 20, Samsung’s notebook PC the ATIV Book 9 Lite is now available for pre-ordering. This is the Lite version of the more extreme Ativ Book 9 PC. The Lite version runs on a custom AMD CPU, described as a ‘white-label’ CPU by Samsung. Samsung was apparently drawn in by the ‘superior integrated GPU in the AMD parts’. This comes in contrast with the decision they made for the CPU inside the Ativ Book 9, going for an Intel Haswell chip. The more powerful version is also announced to come with a 13.3 inch touchscreen at 3200 x 1800 pixels. The Lite version however will still have the 13.3 touchscreen but only at 1366 x 768 pixels. 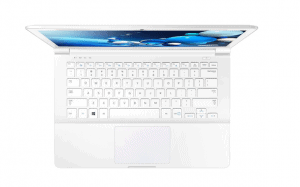 The Ativ Book 9 Lite is currently selling at a starting price of $800, being expected to ship by the 28th of July. One of the coolest feature of the Ativ Book 9 Lite is Samsung’s Side Sync feature. This is a piece of software that allows you to Sync your smartphone/tablet with the PC and use the device’s screen as a second PC screen, or watch a virtual version of the mobile device on the PC’s screen. You can also use the mouse and keyboard of the PC to control apps on the mobile device. This can prove useful in writing texts or navigating through apps.